Inspired by the area of Canakkale, the overlaying and the crossings of many different civilizations from the eastern shore of the Dardanelles Straits to the Mediterranean, the installation ‘Pledges for a Safe Passage’ is concerned with undocumented migration, a global issue that most nations have to deal with increasingly over many years. It is also dedicated to the struggle and hardships thousands of people endure in the hope for a better life. This work marks the process of a passage, a journey from one place to another, from one situation to another, from life to death, from hope to despair. 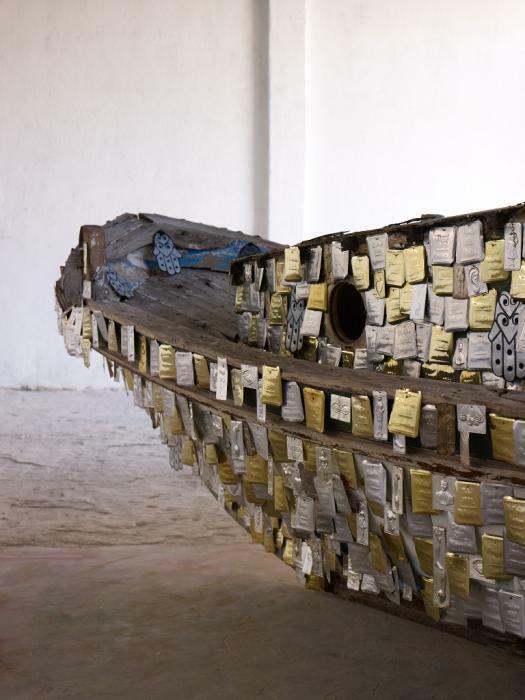 It features an abandoned, worn boat found in Canakkale and numerous votives carrying the names, date and place of birth of migrants that entered illegally Greece’s borders, as well as votives expressing pledges for safety during this precarious attempt. 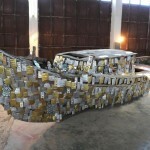 The motif of the boat has been central in Kalliopi Lemos’ practice. Its recurring use both in her sculptural work and her drawings expresses the narrative of passage, a continuous universal human quest. The tamata, ex votives, that are used extensively in the Greek orthodox tradition, act as individual prayers for the safe journey and the realization of the dream. Simultaneously, however, the votives also become witnesses of the drama of those people. Each pledge expresses the fear, the agony and the uncertainty that each refugee experiences in his/her effort to cross to another border. © 2019 Kalliopi Lemos. All rights reserved.